When I read Virginia Woolf‘s Diaries (an experience I recommend to any writer) back in 2011 I remember thinking what horrible bosses she and Leonard were to their hapless, underpaid employees at the Hogarth Press, which they ran out of their home for many years. There is a disturbing diary entry where Leonard and Virginia attend the funeral of one of their middle-aged female employees, a single woman who has died suddenly and prematurely. As the by now comfortably wealthy Woolf sits in the chilly, sparsely attended church, she feels uncomfortable—what can only be described as guilt. Couldn’t she have done more for this woman, been nicer? she thinks. But it is a brief moment, and soon she is back to her solipsistic ways. In truth, she was often hostile to other women, especially those who were “common,” while being perceived in her own time as a crusading feminist and devoted champion of women’s rights. 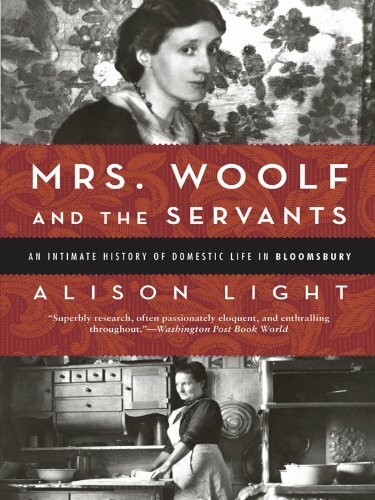 Alison Light’s beautifully researched Mrs. Woolf and the Servants: An Intimate History of Domestic Life in Bloomsbury (2010, Kindle $3.03) highlights the complexities of Woolf’s “servant problem,” which could also be viewed as an intimacy problem. Women of Woolf’s class simply had to have a live-in female servant in the house to do the cooking and cleaning—it was expected, and servants were cheap and didn’t ask for much. But the live-in nature of the relationship posed problems for someone like Woolf, who wanted to be taken care of, but didn’t want to have to cater to the needs of a female domestic on a daily basis. Light frames her book chronologically, starting with the Stephen family’s oldest servant, Sophie Farrell, who was a country girl in her early 20s hired as the cook when Virginia Stephen was a baby. Sophie became the warm heart of 22 Hyde Park Gate, a home which saw its fair share of trauma, grief and emotional repression, especially after Virginia’s mother, Julia, died in 1895. Woolf always kept up an affectionate correspondence with Sophie, even though she was eventually dropped by Bloomsbury when she got too old and drifted over to the Duckworth side of the family, who were (ironically) more loyal and decent to their dependents. Light pinpoints the disturbing truth that Vanessa and Virginia, “modern” and progressive as they were, treated their servants shoddily in the sense of “taking care” of them. On the flip side, their servants rewarded them with loyalty and seemed to care about their employers’ welfare. There is an eye-opening photo of Lottie, Nellie and Grace with Angelica Bell in the 1920s—servants who worked for both Virginia and Vanessa (and were sometimes exchanged between them). Their faces are warm and frank; they’re youthful and smiling. Meanwhile Vanessa and Virginia are exchanging spiteful and whining letters about how exhausting it is to have the servants around, how demanding they are, what a burden, etc, etc. These were the women who literally had to empty their slop pails. I learned much about “earth closets” and water closets from this book, since both Virginia and Vanessa had ramshackle country houses with very few modern conveniences (no indoor toilets!). The servants simply had to deal with it. Indeed, Virginia couldn’t wait to drop Nellie, her cook of 18 years, whose name she always misspelled. 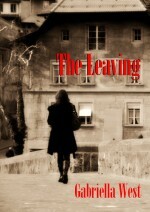 Light dwells on this fractured and troubled relationship for a large part of the book. Nellie was a young girl who had lost her mother early, the same as Woolf had. She arrived in 1916, as Woolf was recovering from a serious breakdown and before she had become famous as a writer. She was blonde and rather ladylike, though we wouldn’t know that from Woolf’s description. The relationship started well, but devolved into a pattern where Nellie asked for perfectly reasonable raises, the Woolfs refused, and then Nellie would threaten to give her notice but ultimately revoke it. It was clearly her only weapon. And money was a serious issue: servants had to depend on the generosity of their employers for financial security and were given no state pensions till later in the century. Light brilliantly demonstrates that Virginia saw working-class women as representing the degrading female body that she so often craved to transcend. She was often repulsed by them. She also disliked their “petty” minds, so stuck in the present day. And as she descended into bouts of mental illness, she always became more obsessive about it. Light’s research shows that the servants were actually more “whole” individuals than Vanessa and Virginia. Nellie and Lottie ended up living together in a nice little house for the rest of their lives (the money for it came not from the cheapskate Woolfs, but from her subsequent employers, Charles Laughton and his wife); even Sophie Farrell outlived Virginia (if only by a few weeks) and sent the most touching letter of condolence to Leonard after her suicide. It seems that the servants were able to thrive, given the sometimes desperate economic situations they were faced with. Although this book calls Woolf to account for her hypocrisies and failures, Light tries to be as fair as possible, given her empathetic bias toward the servants. In fact, for much of the book we’re inside the frazzled mind of Virginia Woolf as she struggles to maintain equilibrium and control. And that, for Woolf fans like myself, is a pleasure—even though I came away with the sad feeling that Woolf’s feminism was only skin-deep, or rather did not extend to the “lower orders,” whom she truly viewed as lacking humanity. But Light returns humanity to these decent women while never in the least indulging in nostalgia about what it meant to be an uneducated female domestic in the first half of the twentieth century in Britain. This entry was posted in Reviews, Writing and tagged Alison LIght, Bloomsbury Group, class, England, female servants, hyde park gate, intimacy, relationships between women, sexuality, Virginia Woolf, women, writers. Bookmark the permalink.